This one makes me think of sunlight on tropical waters. Seams graded and little block pressed. Once the 20th sunflower was finished, I couldn’t wait to see how they’d look on the design wall. There are still many to be made and now that I’ve seen the first 20 all together, I’ve got a few different ideas for setting them. The surprising thing about these sunflowers is how much quicker they are to stitch now that I’ve made quite a few – first for my red and white quilt and now these batik sunflowers. Each one has lots and lots of continuous stitching, putting together the diamonds and triangles, and then my favourite part – curved piecing. I could happily make these for a very long time but I wouldn’t be making them at all if it weren’t for the Inklingo 6″ Sunflower collection as I can’t imagine tracing all the shapes for each one. With Inklingo, it’s so easy to print my shapes on the fabrics and then just stitch, knowing that the stitching lines and matching points are perfect every time. We had quite a thunderstorm last night, but it didn’t disturb Baxter at all. He was having a snooze after chasing his toys around. What a pretty collection of batiks! No wonder Baxter is so tired, doing all that laundry would wear anyone out. Very nice sunflowers, they will make a beautiful quilt! Baxter can even do his own laundry? He is so talented! HA! Cathi, those blocks are stunning one at at time…all together…they are breathtaking! 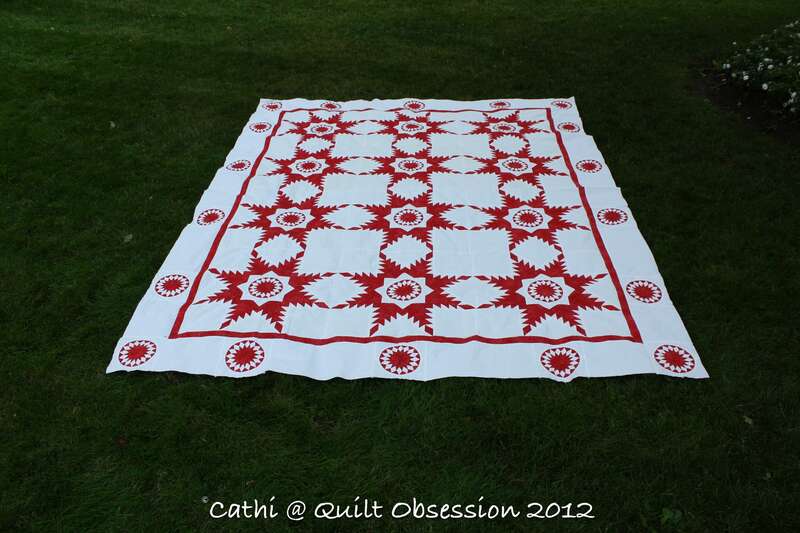 It is exciting to watch over your shoulder and see how the quilt grows and changes. Thank you for sharing!!! WOW!~~ Look at all of those beautiful sunflowers!~ So summery and pretty. I’m loving seeing Baxter’s adventures. Cathi, this might be my all-time! Absolutely gorgeous!! !